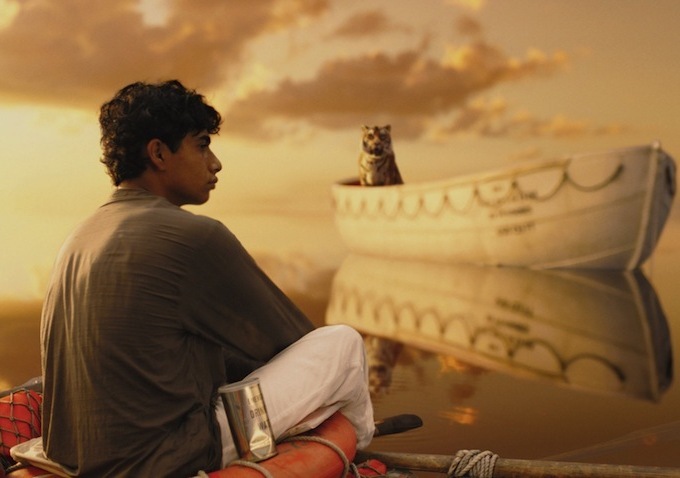 With Life of Pi, Ang Lee turns in his most engaging and confidently made feature since Brokeback Mountain (2005), and perhaps his most visually resplendent one ever. With fully realized characters inhabiting a carefully structured story embellished with stunning — but not overwhelming — visual effects, it’s part elemental survival epic, part coming-of-age fable, and part rumination on the testing of one’s faith. Based on the book by Yann Martel, it opens with a blocked writer (Rafe Spall) visiting a middle-aged Indian man (Bollywood steady Irrfan Khan, recently a heavy in The Amazing Spider-Man) in his home in Canada, following a lead for a story that “will make him believe in God”. The interviewee, the Pi of the title, relates a very personal, very elaborate, and very unusual story of loss and survival. Most of the movie takes place in flashback, as Pi Patel describes his youth in Pondicherry, a (then) French section of India, where his family owns a zoo. Growing up in a diverse environment, young Pi (played by Ayush Tandon) is exposed to Hinduism, Islam, and Christianity; being a broad-minded, inquisitive, and receptive child, he adopts all three. Years later, when financial troubles force the zoo to close, the Patel family is forced to relocate to Canada, taking the animals with them to sell to another zoo. The ship they’re on sinks during a storm; only a teen-age Pi (Suraj Sharma) and a handful of animals survive. Eventually the numbers are reduced to two: Pi and Bengal tiger with the unlikely name of Richard Parker. Survival at sea is tough enough; when you’re sharing a boat with something that will likely eat you as soon as it gets a chance, it’s pretty much impossible. Pi’s Hindu upbringing and childhood affinity for animals prevent him from killing Richard Parker; instead, with plenty of time on his hands, he manages to train him and establish enough trust that the two form an uneasy and very unusual alliance. It’s a long-running gag in Hollywood that directors are usually advised to avoid working with children and animals, as well as filming at sea. Lee rises to the technical challenges, as well as those of a rather tricky story. Of course, it helped that the tiger was CGI and the boat was mounted on a gyroscope in front of a blue screen, but let’s not split hairs. In adapting the novel to the screen, Lee and screenwriter David Magee (Finding Neverland) take a huge risk that has paid off in full. A decade in development, the movie was largely considered unfilmable — and it indeed it was up until the quality of digital effects and 3-D photography caught up with it in recent years. Lee outdoes himself visually, following the lead of Martin Scorsese’s Hugo by using 3-D effects to enhance the story rather than as the focus of attention. 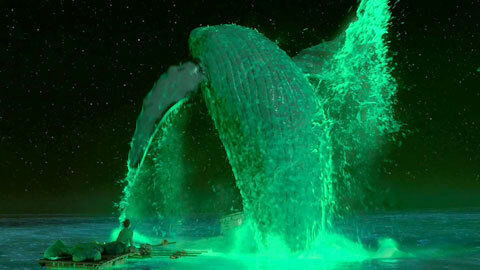 Virtually every scene is stunning, with a painterly dedication to detail, and Richard Parker is an incredibly realistic creation. Lee and his effects crew have set a new standard in photorealism. Still, as many flops have shown us, all the gee-whiz effects in the world don’t add up to much if the story is lacking r if the cast is underwhelming. For the most part, the entire movie rests on the lanky shoulders of Sharma, a young actor who bravely and ferociously inhabits the role, establishing Pi’s complex mix of sensitivity, intellect, heartbreak, and courage. It’s an impressive performance from an unknown, one that will undoubtedly put him on the proverbial map. Lee likes to challenge himself creatively, and isn’t afraid to step outside his comfort zone — if he even has one. He is, after all, the director who repeatedly dives into the deep end via the likes of Brokeback, Crouching Tiger Hidden Dragon, Pride and Prejudice, Hulk, and so on, and usually to good effect. Here, the deliberate pacing and a final-act revelation rock the narrative boat a bit, but don’t quite capsize it. Lee proves himself more than comfortable with pushing the boundaries of storytelling, navigating some very choppy waters indeed.